I’ve been hoping to get to this film before the ink dried on the 100th issue of Rue Morgue Magazine as something of a tie in to the feature interview with Sir Christopher Lee. Well, the ink seems to be firmly set, but it’s also timely that Mr. Lee has just released a rock opera (he and his cohorts prefer the moniker symphonic metal) based on the life of Roman Emperor Charlemagne, who brought Christianity to the pagans, united the European world into what we know it to be today, and of whom Christopher Lee is a direct descendant. Maybe I listened to too much Yngwie Malmsteen and Jason Becker as a kid and have a soft spot for the film musicals Jesus Christ Superstar (1973)and Litztomania (1975), but I’m really digging the album, for all its gaudy operatic lyrics and its grandiose orchestral music. 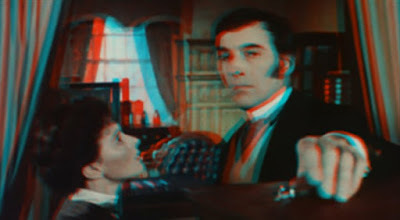 However, this blog’s about 3-D movies and today we’re going to take a look at the closest thing to a Hammer horror film in three dimensions-- that fortunately was never to be shown in 3-D. 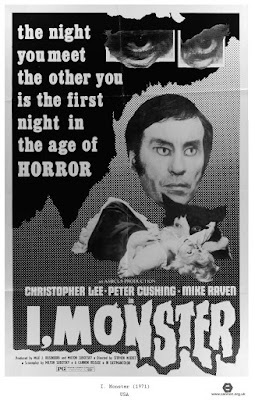 I, Monster (1971) is a retelling of the Jeckyll-Hyde story. Produced not by Hammer Studios but by it's rival Amicus Productions. 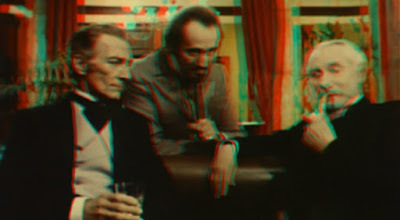 Best known for omnibus features such as Tales From the Crypt (1972) Amicus often exploited audiences' confusion between themselves and Hammer by offering similar subject matter (focusing mostly on the horror genre) and frequently casting known Hammer stars Peter Cushing and Christopher Lee. 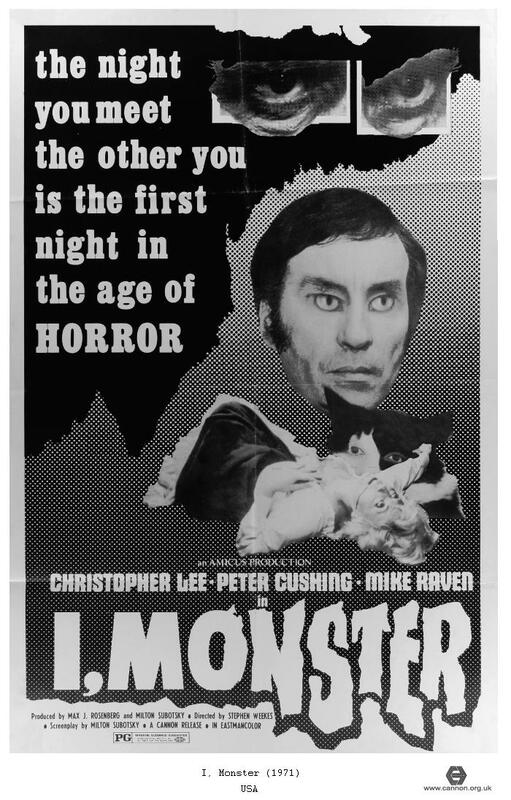 I, Monster shares an even closer tie to the Hammer line of re-envisioned classic monster films by utilizing a well known classic literary monster tale. 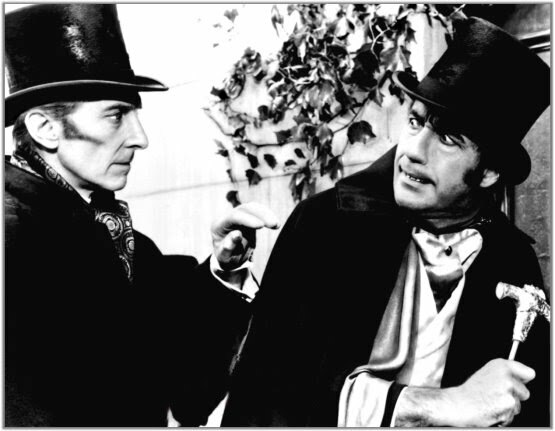 The film, while remaining faithful to the original Robert Louis Stevenson story, adds a layer of drug use and Freudian psychology to explain the good and evil split in personality of the protagonist. Yet the producers thought it wise to distance their film from the original tale, by renaming its main characters. So Dr. Jeckyll becomes Dr. Marlowe and his unchecked superego Mr. Hyde adopts the moniker of Mr. Blake. Both, of course, are played by Sir Christopher Lee. His performance is the highlight of the film, presenting psychiatrist and mad doctor Marlowe as a cold repressed figure, who with the help of his fantastic drug releases his inner demon the playful yet deadly Mr. Blake. Lee accomplishes the first transformation scene with little more the a curled smile and a glee in his eyes. As the film progresses he gets more help from make-up artist Harry Frampton, but it's Lee's performance that sells this metamorphosis from Marlowe to Blake and gives us the audience some insight as to why, at 87 years of age and over 260 films later, this gentleman is still working today. Peter Cushing also makes an appearance in the film, though to a lesser magnitude, as Frederick Utterson (Gabriel John Utterson in the novella) as Marlowe friend and Blake's foe. The reason "It just didn't work, dear boy" was due to the method of 3-d used, known as the Pulfrich effect. Named after Carl Pulfrich, the Pulfrich effect is more of an optical trick than a stereoscopic image. To create the effect viewer wears glasses with a dark lens over the right eye and views a scene in which the camera travels horizontally. Our brains process the image with the darker lens more slowly than with a neutral (or no) lens. As a result the brain fuses the two images into a stereo image. The real issue for film-makers attempting to use the process in a film is that they must keep the camera moving at all times, at a constant speed and avoid actors moving or crossing in the opposite direction to the camera move. That's a lot of elements in a shot to keep in control and is almost impossible to sustain in a feature length film. It's pretty compelling reason to drop the effect from a film. 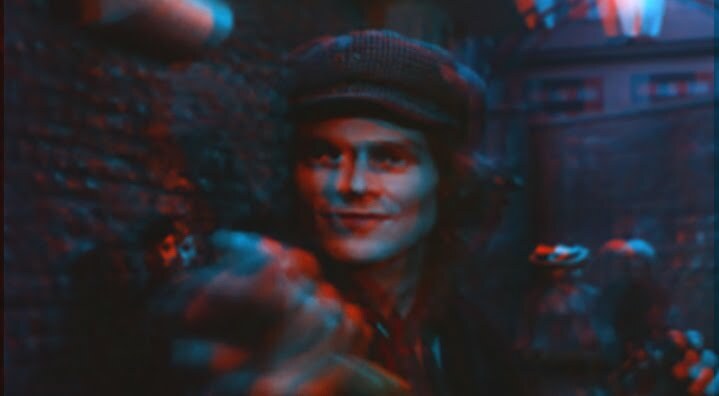 For fun I've created a few anaglyphs from the film that indicate what the 3-D effect may have been (Red lens over the left eye this time, I'll try to be more consistent in the future). 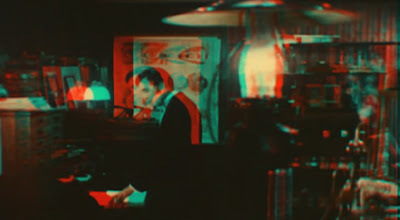 Even though the film was never promoted or shown as a 3-D film much of the initial footage shot in the Pulfrich method still exist within the film itself. 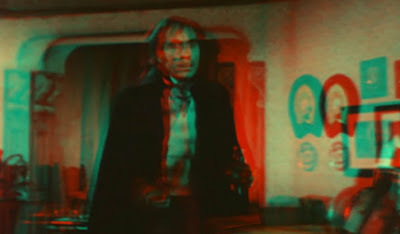 You'll know when it was intended to be in the third dimension when the camera tracks across the lab of Dr. Marlowe. If you have a set of glasses from NBC's 3-D Week way back in 1997 and a lot of patience you'll be able to catch some of the intended 3-D scenes. Why the Pulfrich effect fails the film. Have you tried watching any of the film using the Pulfrich method? Just use a pair of sunglasses over your left eye and watch any sideways-tracking shot in the movie. To me most of the film was shot this way and the effect works really well. The only aspect that was abandoned was the handing out of Pulfrich glasses in theatres. I have watched the film using a pair of Pulfrich glasses. I've never been crazy about the technique and I certainly understand why it was dropped by the producers of I, Monster. Maintaining the effect through camera motion over the course of an hour and a half is taxing on the film-makers but most of all very taking on the audience. If poor projection can create eyestrain in regular 3-D film, a Pulfrich feature would certainly result in nausea. The 3-D effect does work for much of the movie, but I found myself switching the dark lens between eyes, in an attempt to correct inverted stereo (when left and right eyes are swapped) and of course when the camera stops moving so does the stereoscopic effect. I've found a better print of the film then the one I used for my frame grabs, maybe I should give it another watch with the Pulfrich glasses.